Every four years the world gets an extra day in February, and it goes by the name of Leap Day. In the retail world, Leap Day means an extra 24 hours for merchants to maximize their sales. To take advantage of this opportunity, most merchants typically use a variety of Leap Day promotional tactics to increase conversions both in-stores and online. Offering a 29 percent discount is definitely the most popular Leap Day promotion, likely because it’s a memorable sale as well as a good discount for consumers. Offering extra reward points for shopping on Leap Day may not be a popular strategy, but it is definitely a good way to motivate loyal customers to shop on February 29th. 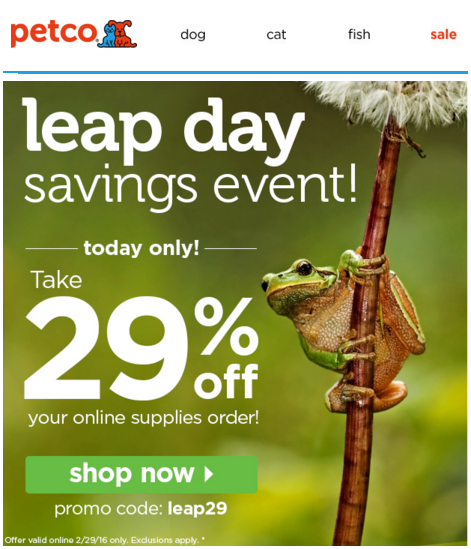 A unique way to celebrate the number “29” on Leap Day is by showcasing a one-day sale of $29 products. Not only can these products by featured in email newsletters and social posts on February 29th, but retailers can also create a Leap Day sale category on their website like Urban Outfitters does in the image featured below. To celebrate the date, Krispy Kreme is looking to persuade doughnut lovers to purchase two dozen sweet treats by offering the second dozen for just $2.29. Although this strategy would have to be altered by other retailers based on their industry (for example, a beauty retailer could offer $2.29 eye makeup remover to consumers who purchase eye shadow), it is a good way to boost average order values (AOV). Even though the 29 percent discount is the most popular Leap Day promotion, merchants can better control their margins by offering a $29 discount on a specified dollar-amount purchase. For example, Starbucks is offering $29 off orders over $100 on February 29th, while Lord and Taylor has opted to offer $29 off a $200 purchase.